Over the past year a New Zealander by the name of Roger Shepherd has had almost unprecedented access to North Korea. He has spent nearly three months in the country over four visits, and was allowed, even encouraged, to travel far and wide into the remotest corners of the country. But how does someone like Shepherd get this kind of access? Is Roger a diplomat? An NGO worker? No, Roger is a hiker. Owner of Hike Korea, Roger recently lectured a large audience in Seoul’s luxurious Somerset Palace on behalf of the Royal Asiatic Society Korea Branch. Roger was talking to promote a photo journal detailing his extraordinary adventures across the mountains of North Korea, and also to promote his upcoming Korean TV documentary. But for the most of his presentation, self-promotion was left to one side in favor of simply regaling the audience with stories and photos of a very unique trip across the spine of the peninsula. Discovering Korean Identity Through Mountain Culture is the motto and philosophy of Hike Korea, and having tamed all of South Korea’s mountains Roger set his eyes on discovering the other half of the peninsula. He told the audience that help for his trip had been surprisingly widespread, coming from the NZ-DPRK Friendship Association, MBC TV, and even (through slightly back-door channels) the South Korean Government. How did Roger secure such support? It seems by remaining as apolitical as possible. 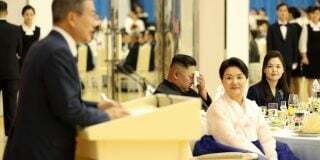 He spoke of rejecting TV and media offers for their interest in obtaining “sensationalist” materials, and despite his good times in the DPRK he seems not have been seduced by his special treatment there. In short, Roger is first and foremost a hiker, and his concerns lie with Korea’s mountains, not politics or taking sides. “I was there to take photos of mountains and that’s what I did”. Indeed, the tourist parts of Kumgangsan have remained closed since the infamous shooting incident in 2008, but Roger, with the help of his Korean team, nevertheless talked his way into visiting these locations. Walking into places they possibly shouldn’t have was a common theme of the lecture, helped by a team and colleagues that included the Secretary General of the New Zealand-Korea Friendship Society, a ‘logistics man’, and local guides that they picked up along the way. For a nation often seen as tightly controlled, it appears that an almost directly opposite situation exists in the mountains. Roger and his team’s journey seems to have been a ‘by hook or by crook’ affair, with wrong directions, bypassed checkpoints, and help from strangers, all playing their part along the way. Some of the mountains that Roger holds out for particular praise include Duryusan, Bukdaebong, and Huisabong. Duryusan was one of the many unmapped mountains which Roger had to tackle with less-than-textbook tactics, with guides leading him through villages, over streams, and up sharp cliff fronts, leading to one journey that had been promised take one hour becoming five. Bukdaebong (slightly off of the Baekdu Daegan route) was one of the many mountains that were home to Korea’s anti-Japanese resistance fighters, and it appears North Korea is keen to demonstrate this fact, with museums, artefacts, and even guides at the top (although who they were there for seems a mystery). Huisabong is a heavily forested mountain at the northern limit of North Korea and seems to fulfill many romanticized views that South Koreans hold of the northern Mountains, complete with wild roaming bears, deer, and even wolves. His visits to remote locations did however mean it was inevitable that he had some interactions with the public. During his presentation he sheds light on the living situation in some of the mountain villages he visited, saying Koreans “don’t walk recreationally, they walk for ‘real’ reasons” such as farming, hunting and travelling from place to place”. His photos also show his guides looking happy and healthy enough, but noticeably lacking in even the most basic hiking or sports clothing and equipment. However, when he speaks of the general public it is mostly restricted to their relationship to his adventure; from ‘teenage boys coming to his rescue’, local farmers giving his group honey, to his guide’s fondness for Pyongyang soju, acorn soju, and pretty much any type of alcohol. Roger Shepherd speaks kindly and warmly of his time in North Korea, without sounding like a recruitment tool or mouthpiece for the North. He seems to hold no agenda and speaks simply but strongly about his love for the people he met and, more importantly to him, the mountains he climbed. 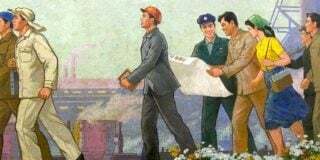 NKNEWS: Thank you for your time. Would you care to introduce yourself and your work? My name is Roger Shepherd a 46 year old New Zealander now residing in South Korea with my own private company called Hike Korea. My company promotes Korean Mountains through photography, writing, and publications. My current project is the publication of a high quality photo-book containing images of mountains of the Baekdu Daegan from both North and South Korea. The Baekdu Daegan is a well revered ridge on the Korean peninsula that stretches along its entire length. It has been admired for centuries as the life line of the Korean people. 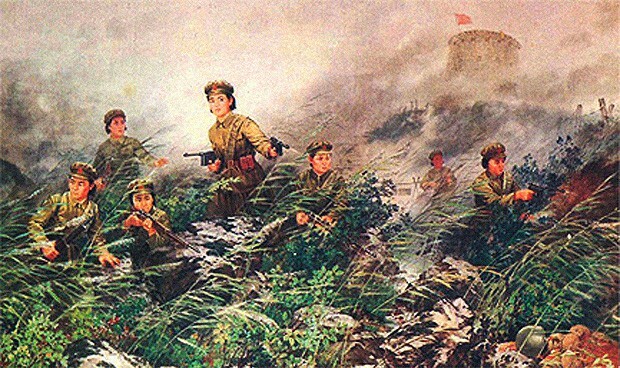 NKNEWS: Your website mentions that your goal is to ‘discover Korea through mountains’. What differences did you find between the North and South’s mountains both physically and culturally? Due to its topography the mountains in the central and southern part of Korea are not necessarily higher but steeper and more dramatic as a result of containing more exposed rock. In the northern part of DPRK, the mountains although higher in altitude are more rounded containing layers of forest and plateaus of wild grasses. Culturally, the people in the North and the South still hold great reverence for their mountains. I think that has always been the case for the Korean people, even they will admit that. It is an ongoing process for me to analyze exactly what that reverence is in the North since division. Under the leadership of Kim Il Sung, the mountains took on a more revolutionary identity, and some sites along the Baekdu Daegan for example have been preserved as ‘secret camps’ from which the anti-Japanese fighters used to take refuge in during their illegal era of occupation here.The latitude of this influence is seen as far south as the bottom of Pyeongannamdo and upper Kangwondo provinces. There are also what’s known as slogan trees, which are standing trees that have had their barks removed and their trunks subsequently marked with either carved slogans or ink written slogans containing messages of revolutionary spirit. 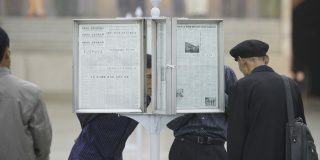 These also derive from the anti-Japanese era of the 1920s to 1945. Sometimes in the North it is easier to focus on the period of history when Korea was one nation and shared common undeniable history. So in that sense I attempt to see if the old stories attached to mountains are still there. I need more time and visits to find this out, but even though there is less evidence of this left over in the North, the Koreans there still have sites that contain relics of old Goryo and Joseon dynasty fortress walls, and have the stories that go along with it – just predominantly a lot less than in the South. For example, there are only about 65 Buddhist temples remaining in the North and most of these are attached to some form of important or recognizable mountain. The majority of them disappeared from fierce bombing during the Korean War and of course the repression of Buddhism during the implementation of Stalinism and then Juche. I think another interesting point should be made that in the North the Koreans recognize five sacred mountains, they being Paektusan, Chilbosan, Myohyangsan, Kumgangsan, and Kuwolsan. The latter is seen as the resting place of Korea’s first ancient King, Tangun, about 2000BC and It is said that he attained the immortal status of San-shin 산신 (mountain spirit) there. A shrine-temple (although not the original) is still kept there. So there is still some form of historical reverence or attachment to mountains in the North, just a lot less, that’s all. Maybe my work there can help to reinvigorate it somehow? You said in your recent lecture that North Koreans don’t generally hike for leisure. What was their understanding or reaction to your trip? What did they make to you putting so much time and effort into, what for them, might be seen as a rather strange hobby? 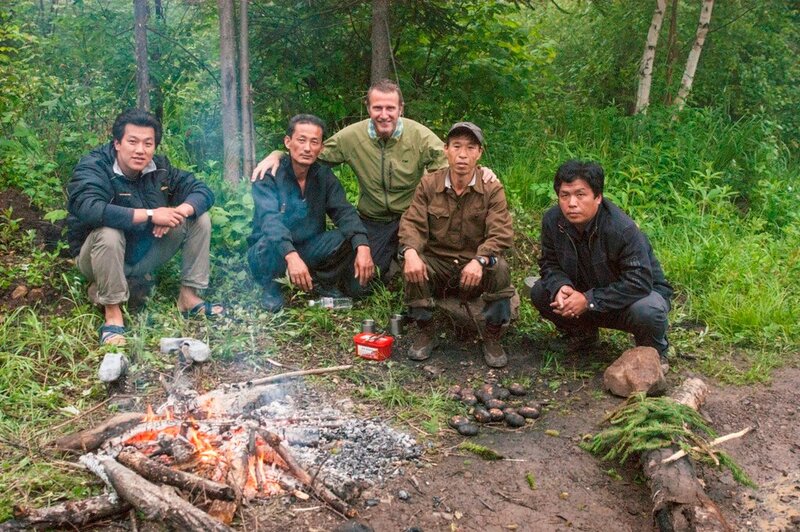 I guess what I had meant in my speech was that the guys I traveled with from Pyongyang weren’t really the woodsman or outdoors types, and at stages, some of them struggled with the idea of spending all day trying to get up a mountain, but in the end they did it with me, and seemed to enjoy the experience. As they told me after the journey, my travels gave them the opportunity to see parts of their own country they had never seen before. Otherwise, the local people we used as guides had no issues getting up to the peaks with me, as they are quite fit and familiar with the mountain and its forests. But as I said earlier, the people of the North wouldn’t bother with the idea of recreational hiking, as it’s just not simply part of their lifestyle. In a sense this was a little refreshing to see, because the Koreans in the North have an acute relationship with the outdoors, in that they treat it as a form of natural survival, and have good knowledge of its foods and wares. Trails in the mountains there are used by them to either transport themselves from one village to the next, or as access points for collecting herbs and spices, timber materials or hunting. There was a real woodsman feel about the guides that I worked with and it felt like I was experiencing a timeless tradition. The locals loved the idea of my work, and seemed proud to want to be part of what sounded like an important project – this is to collect photos of mountains of the Baekdu Daegan for the purposes of a photo-book featuring images from North and South Korea. They simply liked the idea and trusted me, meaning that I had no other intentions other than to promote the Baekdu Daegan. They hope that I can provide people outside of North Korea a view from a different angle – that is through mountains of the Baekdu Daegan which belong to all Koreans. There is a quiet message of hope in my work, that it might bring something positive to the peninsula, and that it might help all Koreans recognize the Baekdu Daegan as a single symbol of identity that they all share and perhaps can cooperate together with. With North Korea looking to increase tourism cash, do you feel hiking in North Korea could ever become big (or at least bigger) business? It most certainly could if they ever decided to do that. I know that many South Koreans would relish the chance to hike mountains in the North, but that is still a long way off. However, I personally enjoyed not seeing tourism being big in the North as it kept things, including the people, in an untouched state. But that is a rather selfish approach to take, so I hope that DPRK can take advantage of their wonderful mountains one day but at the same time maintain some of that peaceful dignity that can quickly disappear in mass tourism projects. It seems like you had pretty free access, but do you think therewas any attempt to inhibit or control your interactions with the North Korean public? There was never any rules about me talking to other people if I wanted too, but what you have to remember is that most of the time we weren’t around large numbers of people, because we were traveling in a vehicle or in the mountains with local guides. We just quite simply got on in an unbiased manner that was focused towards our efforts to find routes and trails up the mountains with the local guides. I think they appreciated this genuine approach. When I was sitting around eating and drinking with them they enjoyed sharing stories with each other about Bears, wild pigs, mountain foods, and traditional medicines. It was how I wanted to travel, I wanted to hear about their daily experiences in the villages and mountains, but never pushed them for it, just let it come out of them naturally. As a New Zealander we like to treat everyone fair handedly and without bias and not get to personal with people initially. 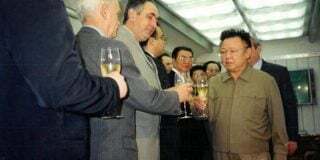 North Korean people are not necessarily comfortable around foreigners initially, so friendships can take a while to forge, so a down to earth approach can warm things up a little quicker. Mountains certainly opened many doors for me, throughout Korea. To Korea in general, it seems to be searching for something to hang its hat on tourism wise; do you think mountains could be it? I definitely think it could be that, although the market of mountain hiking is more a special interest group area. However, if you put aside tourism for a moment, and think about what is the identity of Korea, what makes it unique, is there something that currently does that? In a post civil war Korea and post Japanese occupation, I don’t think there currently is, at least nothing that outlines the ancient history of the Korean people. Korea needs a symbol that acts as backdrop to its history and identity, and I believe its stunning and accessible mountains adorned steeply in colorful religious, spiritual, and nationalistic history could do that. When people think of Korea, I want them to think of a sea of mountains that anyone can wander freely and safely in, and that takes its users on a journey into the hearts and minds of the Korean people and all their national treasures. As for your personal work, what has South Korean reaction been like thus far to the photos you’ve brought back with you? Always very positive. Sometimes I’m met with some envy, which I understand, but my work in the North could one day lead to opportunities for people to have access to the mountains there, otherwise I feel that when the South Korean people are looking at my photos from the north, they are able to view them without discrimination, and more so with interest, because they are merely mountains. Finally, it seems like you are keen to return to the Baekdu Daegan. What more do feel there is for you achieve there? What keeps drawing you back? 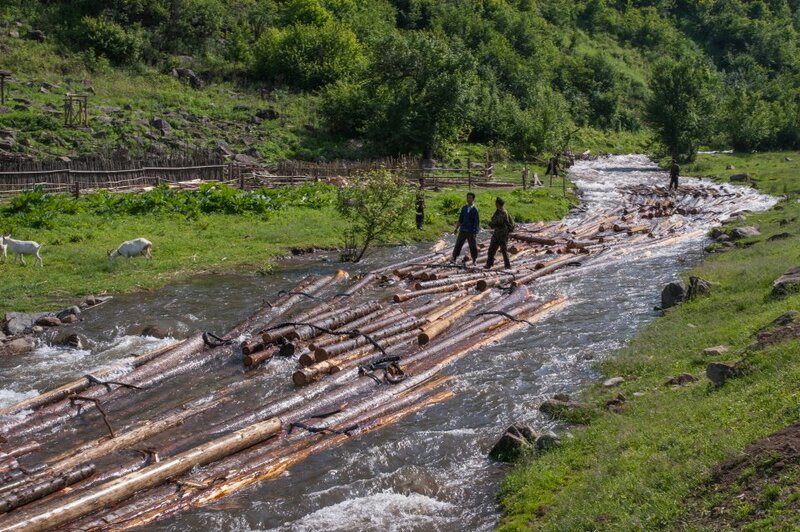 My next big goal is to walk the entire length of the Korean peninsula on the Baekdu Daegan. My colleagues in the North are keen to make this happen, and I would like to promote it as a peace walk for Korea. I intend to promote this idea more once my photo pictorial book of the Baekdu Daegan of Korea is released in about June 2013. If I can get more unprecedented access to the unexplored ridge of the Baekdu Daegan in the North, then I’m sure there will be a number of companies prepared to sponsor such an expedition. I would aim for something to be achieved in 2014. Due to weather it would be better to start from Paektusan in June and walk south for 3 to 4 months to the border, before spending the last 2 months walking the section in the South to Jirisan, but I would like to continue onwards and end up in Hallsan. Why? Paektusan is seen as the grandfather mountain of the Korean people, Hallasan its grandmother, what better way to visit the genealogy of the Korean people by walking its family of mountains? Over the past year a New Zealander by the name of Roger Shepherd has had almost unprecedented access to North Korea. How? 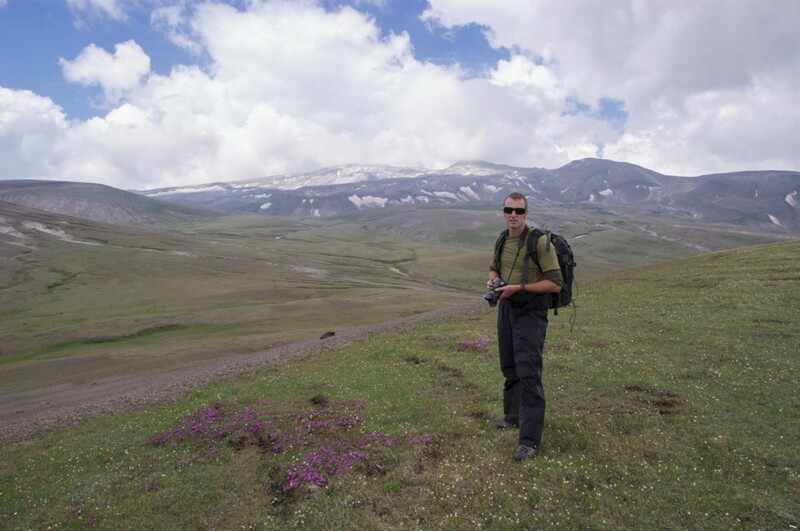 By exploring the country's rugged mountain ranges. Subscribe to read the remaining 2886 words of this article. 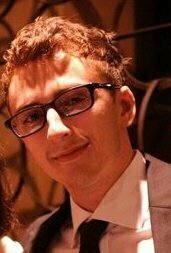 David Slatter is a remote contributor and intern-editor for NKNews. He is a resident of Seoul and is active in the North Korean Human Rights movement there. He is a graduate of International History and Politics, and the current focus of his study and writing is Inter-Korean relations.